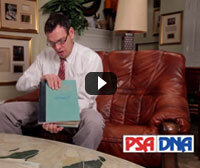 The 2014 National Sports Collectors Convention is upon us as PSA heads to Cleveland, Ohio, for the big show July 30-Aug 3. In addition to offering onsite authentication and grading specials and a special-edition Sports Market Report (SMR), PSA has put together a promotion for fans of fantasy cards – The Cards that Never Were. Collectors, especially those who appreciate vintage cards, have long been fascinated with the cards that could have been produced but never were. For some players it was a contract dispute and for others it was military service, but for one reason or another, many great cards were not to be. One vintage set that seems to be missing some key cards is the 1934-36 Diamond Stars baseball issue. In the following article, PSA’s Joe Orlando discusses which fantasy cards made the cut for PSA’s new National Show promotion. This 60-card set is not only filled with Hall of Famers like Georges Vezina, Howie Morenz and King Clancy, but it also contains a collector-favorite – a card featuring the fabled Stanley Cup. Beyond the inherent scarcity of the cards, this set is also very tough in high-grade. To illustrate the point...this year’s winner for Best Pre-War Vintage Hockey set is the only complete set on the registry – ever – and it possess a GPA of 7.25, making it almost a full point and a half higher than the next best set in the category at the time of the awards deadline. The combination of being the first to complete the set and in such terrific condition made this one a standout in 2014. Click here to view this amazing collection. The PSA Set Registry Luncheon will be held on August 1st. For those who sent their RSVP’s, we look forward to seeing you there! Hurry! Set Registry Special Ends 7/31! 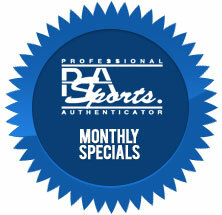 All Sports & Non-Sports Cards ’ $8 per Item/No Minimum – 30 Business Days (approx.) Click here for details. Jim Brown’s 1964 NFL Championship Ring, a 1954-55 Ted Williams Game-Worn Uniform and the First and Only True "Baseball" Car Highlight the Lelands.com Spring Catalog Auction, Closes July 25. Jim Brown’s 1964 NFL championship ring, a 1954-55 Ted Williams "Harry Agganis" game-worn uniform and the first and only true "baseball" car – a custom-designed Volkswagen Beetle featuring a white exterior with red baseball stitches, Rawlings baseball glove seats, a baseball gear shift and baseball bat emergency brake – are among the one-of-a-kind sports memorabilia being offered as part of the Lelands.com Spring 2014 Catalog Auction, which closes July 25. This is the final week to place bids in Greg Bussineau Sports Rarities’ "Summer 2014 Vintage Trading Cards and Memorabilia Auction." The auction features 715 lots of important rarities, highest graded examples, legendary Hall-of-Famer cards, and complete and partial sets. Historic Autographs Is Offering a $2,500 Reward at the National! Historic Autographs will pay a $2500 cash reward to any collector that completes a 2014 HA Originals, 1941 72-card set and places it on the PSA/DNA Set Registry by noon Sunday August 3, 2014, the last day of the National Sports Collectors Show. PSA will be giving away PSA-graded samples of Game of Thrones SM and X-Men™ trading cards at the Comic-Con International: San Diego convention, July 24 - 27, 2014. Love of the Game Auctions, an internet-based sports auction house catering to the passionate collector of cards and memorabilia, announced the launch of its "Set Builder’s Auction," an internet-only auction featuring single cards, smaller lots, and collector-grade treasures. There are 764 lots for auction that will end on Thursday July 24, 2014 at 11 PM EST using the 15 minute rule. This auction features many high grade and low pop cards for collectors to complete their sets from the 1950's through the 2000’s. There is a nice group of 1952 Topps in PSA 8, some which haven’t seen the auction block in many years. The auction is open for bidding and closes Thursday, July 24th. This auction features many quality PSA and PSA/DNA Certified items including a stunning Limited Edition Ted Williams Signed Bat PSA/DNA. Auction also includes a large break up of signed items including Babe Ruth, Sandy Koufax, Derek Jeter and many more! Also offered are 1/1 high end vintage Baseball cards from 1909 with SMR values up to $12,000! Sports Artifacts from America’s first ’Hall of Fame’ museum including a Circa 1955 Heisman Trophy and Boxing Gloves and Robes Belonging to Jack Dempsey and Gene Tunney Highlight Auction Starting on August 6th. 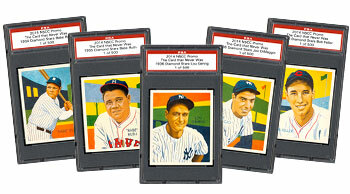 Collectors purchase 1,300+ lots including more than 200 Babe Ruth items at www.GoldinAuctions.com. Which of the following fantasy cards do you think would be worth the most?